This season, Saturday Night Live has been spreading some good vibes throughout the music industry. 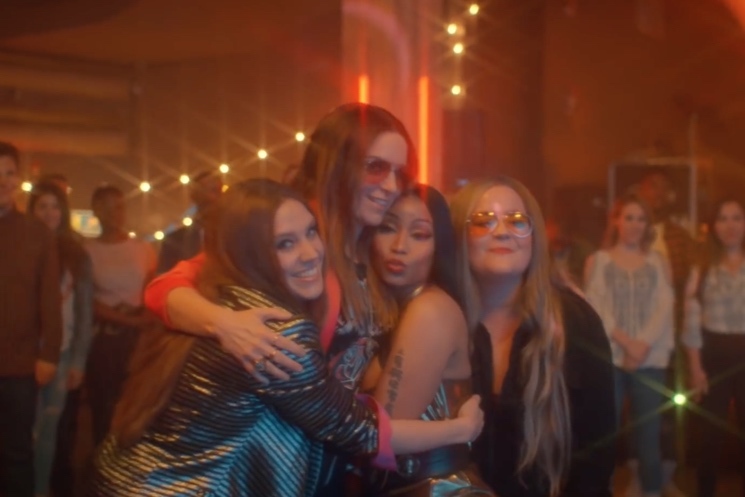 Last month, St. Vincent celebrated when Jack White appeared on the show using her signature model guitar, and today HAIM are flipping out following a parody sketch featuring Nicki Minaj. The sketch — which was cut from last night's episode due to time constraints but shared online — features host Tina Fey pus cast members Aidy Bryant and Kate McKinnon singing a song about friendship in the style of HAIM (it sounds a like like "Little of Your Love"). The women are even made up to look like the HAIM sisters, right down to their hairstyles and big orange sunglasses. At the end of the song, Nicki Minaj shows up to deliver a fire-breathing verse. HAIM apparently had no idea this was going to happen, since they reacted with shock and delight on Twitter. See their all-caps messages below, and watch the SNL video at the bottom of the page. This isn't the first time HAIM have made their mark on SNL — they were the musical guests on the show almost exactly a year ago.